The hand-held fire extinguisher is simply a pressure vessel from which is expelled a material (or agent) to put out a fire. The agent acts upon the chemistry of the fire by removing one or more of the three elements necessary to maintain fire—commonly referred to as the fire triangle. The three sides of the fire triangle are fuel, heat, and oxygen. The agent acts to remove the heat by cooling the fuel or to produce a barrier between the fuel and the oxygen supply in the surrounding air. Once the fire triangle is broken, the fire goes out. Most agents have a lasting effect upon the fuel to reduce the possibility of rekindling. Generally, the agents applied are water, chemical foam, dry powder, halon, or carbon dioxide (CO 2 ). Unfortunately, no one agent is effective in fighting all types (classes) of fires. The type and environment of the combustible material determines the type of extinguisher to be kept nearby. Water extinguishers of the "gas cartridge" type operate in much the same manner, but the pressure source is a small cartridge of carbon dioxide gas (CO 2 ) at 2,000 psi, rather than air. To operate a gas cartridge unit, the end of the extinguisher is struck against the floor, causing a pointed spike to pierce the cartridge, releasing the gas into the pressure vessel. The released CO 2 expands several hundred times its original volume, filling the gas space above the water. This pressurizes the cylinder and forces the water up through a dip-pipe and out through a hose or nozzle to be directed upon the fire. This design proved to be less prone to leakdown (loss of pressure over time) than simply pressurizing the entire cylinder. In foam extinguishers, the chemical agent is generally held under stored pressure. In dry powder extinguishers, the chemicals can either be put under stored pressure, or a gas cartridge expeller can be used; the stored-pressure type is more widely used. In carbon dioxide extinguishers, the CO 2 is retained in liquid form under 800 to 900 psi and is "self-expelling," meaning that no other element is needed to force the CO 2 out of the extinguisher. In halon units, the chemical is also retained in liquid form under pressure, but a gas booster (usually nitrogen) is generally added to the vessel. Water has proven effective in extinguishers used against wood or paper fires (Class A). Water, however, is an electrical conductor. Naturally, for this reason, it is not safe as an agent to fight electrical fires where live circuits are present (Class C). In addition, Class A extinguishers should not to be used in the event of flammable liquid fires (Class B), especially in tanks or vessels. Water can cause an explosion due to flammable liquids floating on the water and continuing to burn. Also, the forceful water stream can further splatter the burning liquid to other combustibles. One disadvantage of water extinguishers is that the water often freezes inside the extinguisher at lower temperatures. For these reasons, foam, dry chemical, CO 2 , and halon types were developed. Carbon dioxide (CO 2 ) extinguishers, effective against many flammable liquid and electrical fires (Class B and C), use CO 2 as both the agent and the pressurizing gas. The liquified carbon dioxide, at a pressure that may exceed 800 psi depending on size and use, is expelled through a flared horn. Activating the squeeze-grip handle releases the CO 2 into the air, where it immediately forms a white, fluffy "snow." The snow, along with the gas, substantially reduces the amount of oxygen in a small area around the fire. This suffocates the fire, while the snow clings to the fuel, cooling it below the combustion point. The greatest advantage to the CO 2 extinguisher is the lack of permanent residue. The electrical apparatus that was on fire is then more likely to be able to be repaired. Unlike CO 2 "snow," water, foam, and dry chemicals can ruin otherwise undamaged components. As extinguishing agents, halons are up to ten times more effective in putting out fires than other chemicals. Most halons are non-toxic and extremely fast and effective. Chemically inert, they are harmless to delicate equipment, including computer circuits, and leave no residue. The advantage of the halon over the CO 2 extinguisher is that it is generally smaller and lighter. Halon is a liquid when under pressure, so it uses a dip-tube along with nitrogen as the pressurizing gas. The aluminum pressure vessel is made by impact extrusion. In this process, the aluminum block is put into a die and rammed at high velocity with a metal casting tool. The force liquifies the aluminum and causes it to flow into the cavity around the tool, thus forming the open-ended cylinder. This cylinder is then finished in necking and spinning processes, which form the open end of the cylinder. manufacture of halon fire extinguishers by January 1, 1994. This will eliminate a potential threat to the earth's protective ozone layer, which halon molecules—highly resistant to decomposition—interact with and destroy. 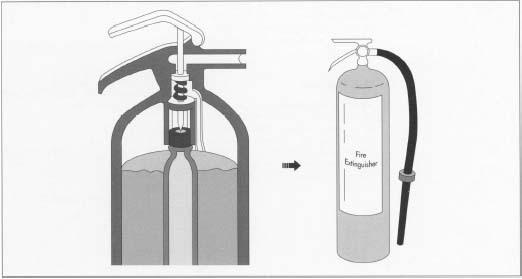 In a typical gas-cartridge extinguisher, a spike pierces the gas cartridge. The released gas expands quickly to fill the space above the water and pressurize the vessel. The water can then be pumped out of the extinguisher with the necessary force. the open end with another operation called spinning. 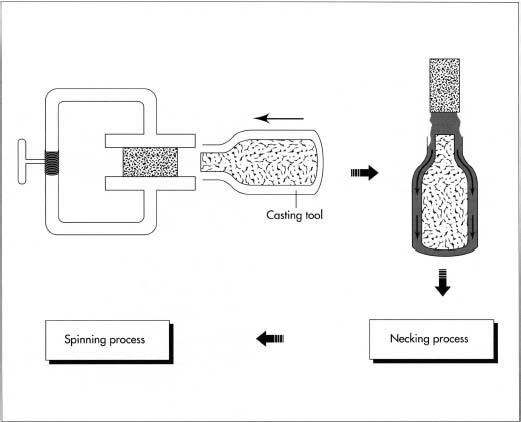 Spinning gently rolls the metal together, increasing the wall thickness and reducing the diameter. After spinning, the threads are added. Is there a way to determine the psig on a vintage Amity Fire Extinguisher? What is the actual process of making/manufacturing Fire extinguisher ? What are the ingredients/contents used in the manufacturing process ? Please mail me the answers if possible.